Fresh ripe mangoes are super delicious and fresh mango ice cream is just fabulous. Mango is the king of fruits and is so versatile. Can anyone resist this delicious golden tropical fruit? Mangoes are the crowning glory of summer and when you step into the fruit market, you just can’t help but admire the gorgeous mangoes arranged so neatly in baskets and also in huge pyramids. So many varieties… very difficult to select… just irresistible! Whichever way you choose to relish them, you will thoroughly enjoy them. They blend so well in milkshakes, smoothies, fruit salads, salsas… the list is endless but most importantly in kulfi and ice cream!! Mangoes lend their beautiful, rich golden yellow color to every dish they are added to and are so appealing to the eye. Children, young or old… everyone’s eyes light up when you just see or hear the word “MANGO”. While summer is in full swing and mangoes are in season, we are enjoying them. Mangoes are perfect for ice cream so I couldn’t help but went ahead and churned out this fresh, velvety smooth and creamy Mango Ice Cream without an ice cream churner or machine. Mix the sugar, corn flour and salt in a large saucepan. Whisk together milk and beaten eggs. Add this mixture into the saucepan and mix until well blended and smooth. Place the pan over low heat and cook; stirring constantly, until the custard thickens and coats the back of the spoon. After the custard cools, put it in the fridge to chill for about 2 hours. Meanwhile, wash, wipe, slice and scoop out the thick flesh of 2 ripe mangoes (I used Ratnagiri Alphonso mangoes) and use a blender/mixer to get a thick puree/pulp. Blend the mango puree and whipped heavy cream with the prepared chilled custard. Pour in containers, cover and freeze till you get a thick frozen one inch rim. Beat the ice cream with a fork or use a food processor to break ice crystals if any. You may have to do this a few times in case you do not have an ice cream machine. Freeze the ice cream till firm. Just before serving let it soften in the fridge for 15 mins. or till it is comfortable enough to scoop with ease. Serve the ice cream in cups/bowls/cones/waffle cones. Enjoy your home made fresh mango ice cream. You can even top the ice cream with diced mango pieces. 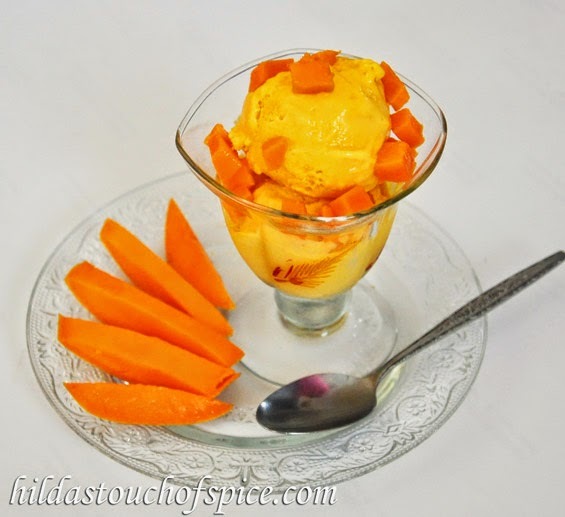 It is always better to use fresh mangoes to enjoy and relish the flavor of the ice cream. Always select ripe mangoes which are firm, give out a good aroma and try to get ones without blemish. Avoid using forced ripe mangoes. To enjoy and relish the original taste of mango ice cream, it is important to use good quality mangoes. Alphonso mangoes are the best but you may use any good quality mango. For a good texture and color of the mango ice cream, the mangoes should be pulpy and non- fibrous. You may use canned or ready pulp sold in the market if you are unable to get fresh fruit but fresh seasonal fruits are the best. Using juicy mangoes may turn your ice cream crystalline. To enjoy smooth and creamy ice cream always use creamy milk and thick cream. It also helps the ice cream to be firm and solid. Remember ripe mangoes are very sweet so adjust and add sugar accordingly. Serve ice cream in chilled cups and bowls to ensure that it does not melt quickly especially in warm weather. Ice cream firms up better in aluminium containers and also sets faster in shallow containers.